Whilst we are talking about all things Welsh ( see previous post re Welsh Rugby Card) I had a sudden urge to bake some Bara Brith (Welsh Speckled Bread) after seeing it being done on the British Bake Off program. 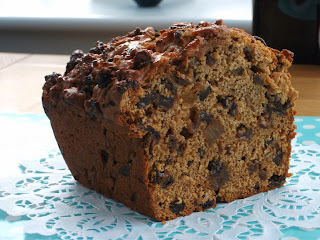 The version the young lady baked there was a proper yeast based recipe where you have to knead and prove as with any other loaf ... this recipe is an easier version some would say a cheat ... but it still tastes like the Bara Brith that my mum used to give us :) . Pour the cold tea over the mixed dried fruit in a large mixing bowl and cover and leave to soak overnight. Following day : mix the egg, honey orange zest & juice and the sugar and add to the soaked fruit. OH MY YUMMO, ANNIE! This looks so GOOD! Thank you so much for sharing your recipe!